These books were SO GREAT, and physically beautiful too. I got numbers 7 and 8 in Canada and the 'Unauthorised Autobiography" too, so they have different but equally beautiful covers to the UK editions. 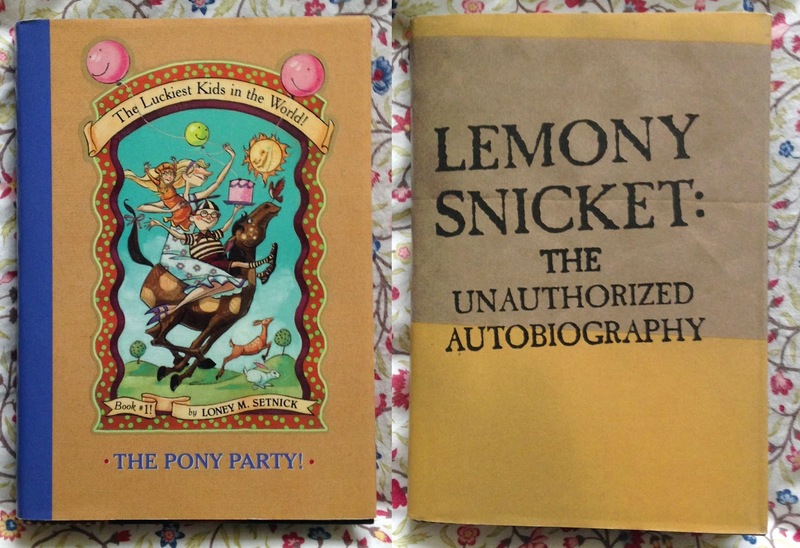 The signature humour and quirky writing style of Snicket felt so refreshing to read. The story of these three very unfortunate orphaned siblings spans 13 volumes, as they are shunted from one terrible or unsuitable foster carer to the next, slowing figuring out more about the mysterious secret organisation their parents belonged too, narrowly escaping the dreadful Count Olaf at every turn. It's an fantastic tale, with really great characters- even the baby is well developed- it never patronises, but teaches the reader words and theories along the way. The grim story made endlessly fascinating and readable with the use of quirk and humour in even the most unfortunate of events. Uncle Monty might just have been my favourite in The Reptile Room, he is exactly how I imagine Newt Scamander will be in Fantastic Beasts. I can remember reading The Vile Village and The Hostile Hospital on holiday in Canada- I was very excited to get them as they were not yet published in the UK. I think I read them them in 2 seconds flat in the RV we were travelling from Calgary to Vancouver in- that was a fun holiday! I also got the Canadian The Unauthorized Autobiography, which has a very different cover from the UK edition. The false cover (for keeping the book secret) reads "The Luckiest Kids in the World! Book 1! The Pony Party! by Loney M. Setnick." What more can I say: I loved them! The Unauthorized Autobiography/The Luckiet Kids in the World! 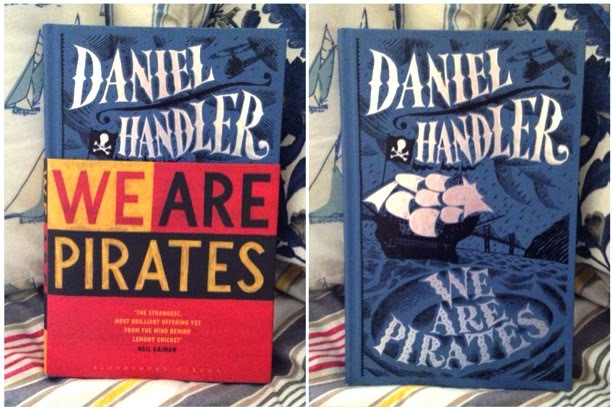 I've read only one of Daniel Handler's (Snicket's real name) books for adults, We Are Pirates, but the weird and wonderful quirky writing style is still there so I'll have to read some more. I also have one of his All The Wrong Questions series as Lemony Snicket, which have realllllly nice illustrations by Seth, I might have to collect a few more of that series. REVIEW! 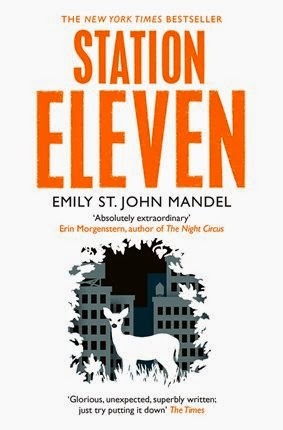 : Books I read in March: Station Eleven, We Are Pirates, The Sin Eater's Daughter. Not much of a theme for this month's reads, just books that caught my eye or were in the to-be-read pile- they're gooduns though! So we've got Station Eleven by Emily St. John Mandel, We Are Pirates by Daniel Handler, and The Sin Eater's Daughter by Melinda Salisbury. I do love a bit of post-apocalyptic fiction, so I was very much looking forward to reading this. The story follows a travelling Shakespearian acting troupe and orchestra across America, twenty years after a devastating global outbreak of avian flu. The story follows several character narratives pre and post flu, each linking up through shared objects or experiences. It beautifully links up past and present, showing connections only the omniscient author can share with us, leaving you hoping the characters will figure it all out too. It had a lot of what I like about post-apocalyptic stories, but no zombies or dystopian regimes, and less focus on loneliness and survival. Instead there was community and civilisation growing out of the remnants of the past. Death and violence were there, but love and relationships were too, and theatre and music. Mandel also added references to the rest of the world outside of America throughout, the lack of which annoys me in other stories as I want to know what happened EVERYWHERE. It was good! Read it! This gem caught my eye in the book shop with its beautiful cover and dust cover, both with really nice designs. So I read it in real book form (I usually read on Kindle)! This is the first Daniel Handler book I've read, having of course read a lot of his work as Lemony Snicket. On the cover there is a quote from Neil Gaimen saying it is "the strangest, most brilliant offering yet" from Handler, and strange it truly is! It is dark, witty, weird, disturbing, charming all at once, which is fairly disconcerting, but it's an entertaining read throughout. Handler's quirks are ever present in his writing as they are when he's Lemony Snicket. It takes place in such a 'normal', mundane, modern setting that the story really takes you by surprise. I definitely recommend reading this, but be prepared for the weird with the wonderful. A dark fairytale story set in a corrupt kingdom, with a mad Queen and bizarre traditions. Twylla is the daughter of the Sin Eater, and so it was her destiny to become a Sin Eater too, until the Queen plucked her out of the village and brought her to live in the castle under the belief that Twylla is in fact the embodiment of a Goddess. This position means she has to serve as the executioner of traitors, killing them with the touch of her skin, and also means no will touch or go near her for fear of death. I greatly enjoyed this book, and was very pleased to realise it would be a trilogy. There were points in the book that I grew tired of the romantic storyline, it felt unnecessary and a little out of sync with the tone of the rest of the book, but this all began to make sense as a I read on. This really did feel like the first act of a bigger story, so I'm looking forward to the next act, in which I hope there will be a bit more movement, in the form of travel, and also depth as more of the veil is lifted for Twylla and she discovers more about the world outside of her sheltered childhood. I'm reading Sally Green's Half Bad at the moment, which is real great, then I've got a few others lined up, possibly Ice Cream Star and maybe Half Wild. Childhood favourites coming soon too! Sometimes I forget that I actually read a few books which were NOT part of the Harry Potter series when I was growing up. There were whole other series that I adored, authors whose every book I had to own, stories I would revisit again and again. 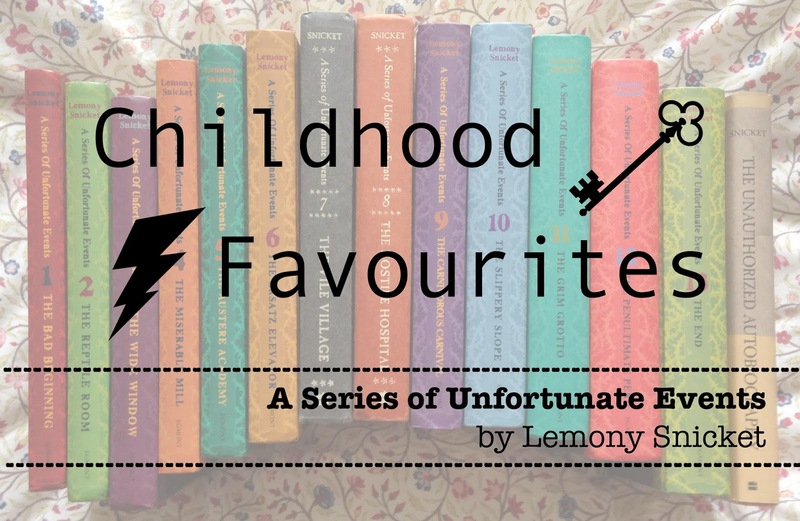 So, to honour these almost-forgotten-favourites, I will be taking a little trip down memory lane over a series of blog posts to share my favourite childhood books and probably a few teenage favourites too! A lot of them are still popular with children and teens today, which makes me very happy, and some may have been forgotten, but either way I'll be giving them all a little bit of attention here. 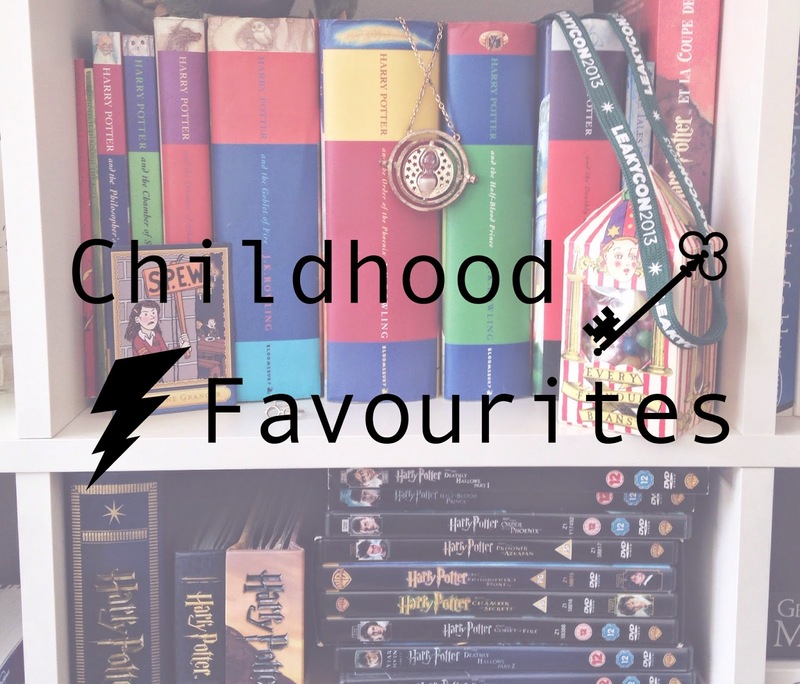 What were your childhood favourites? Let me know! March reviews coming soon too! 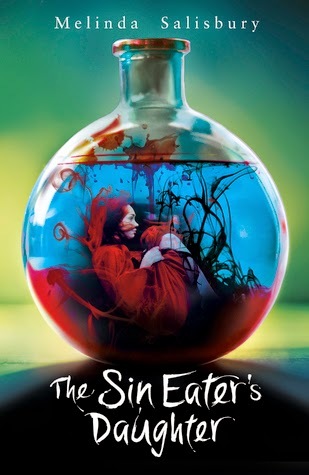 I read We Are Pirates by Daniel Handler, Station Eleven by Emily St. John Mandel, and The Sin Eater's Daughter by Melinda Salisbury. I'm almost finished Sally Green's Half Bad, so that may sneak into the March reviews too!